Previously, I have shown you how to use SEOPressor Role Settings. And now that you are coming to the end of the tutorial, I will show you how to check your license activation status and update your SEOPressor plugin version whenever we have any updates. 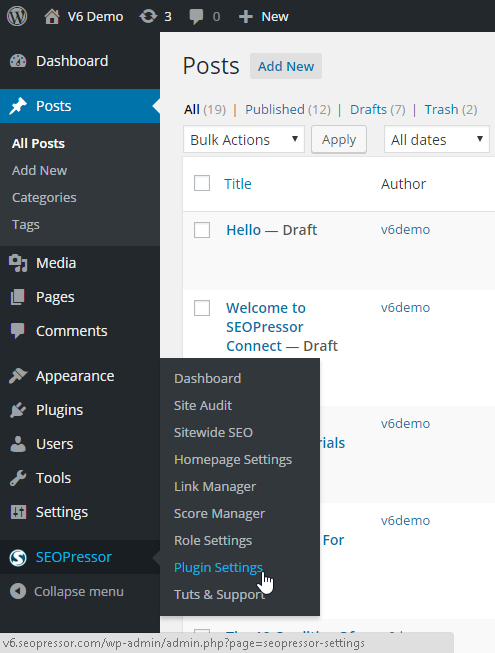 Step 1: Go to the WordPress menu on your left, click ‘SEOPressor > Plugin Settings’. Here’s how the Plugin Settings page looks like. 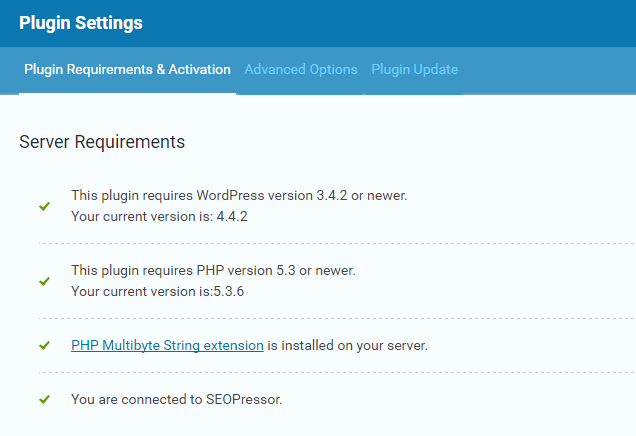 At the Plugin Requirements & Activation tab, you can check out the server requirements. If you have green checks for all of the requirements, it indicates that your SEOPressor plugin is up-to-date and there are no changes needed. Step 2: Scroll down to the bottom until you see ‘Licensing’. If you have a multi-site license, here’s where you can check all your websites’ Score & Health easily. Let’s get to the next tab, Advanced Options. Here, you can choose whether you want SEOPressor to analyze your entire site or just content only. It’s completely up to you. You can also choose whether to have the SEOPressor on-page analysis to slide out automatically or not by turning the toggle on or off. 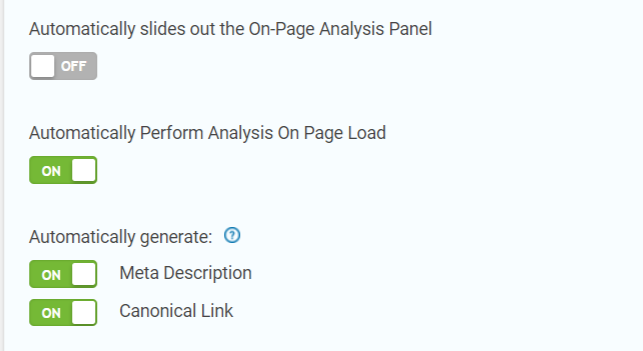 Next, you can toggle on and off for the plugin to automatically perform analysis on page load. The plugin can also automatically generate your meta descriptions and canonical links. Then, key in the characters that you’d like SEOPressor to omit when analyzing. At the Minimum Publishing Score, you can choose whether to fill it in or not. Let’s say you have keyed in ’50’, then all of the blog posts that are scored less than 50% will not be able to publish. If you leave it blank, then your blog posts will be able to publish no matter how low or high the score is. Once you’re done, click ‘Update‘. At the last tab, Plugin Update. 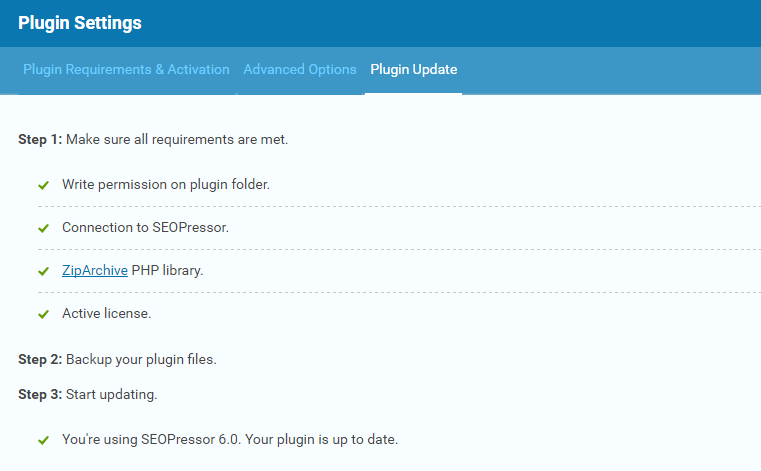 Here is where you can check your SEOPressor Plugin. We will inform our users when there is any updates available. So make sure to take note of the News Stream board in SEOPressor’s Dashboard just in case we have any announcements.